How many times have you needed a burner number to give to a random contractor, a car dealer who is going to call you over and over, or a girl that you met at a party that you are not sure if you want to see again? Perhaps, maybe not the last scenario, but there are definitely times when you would rather not give your number out. 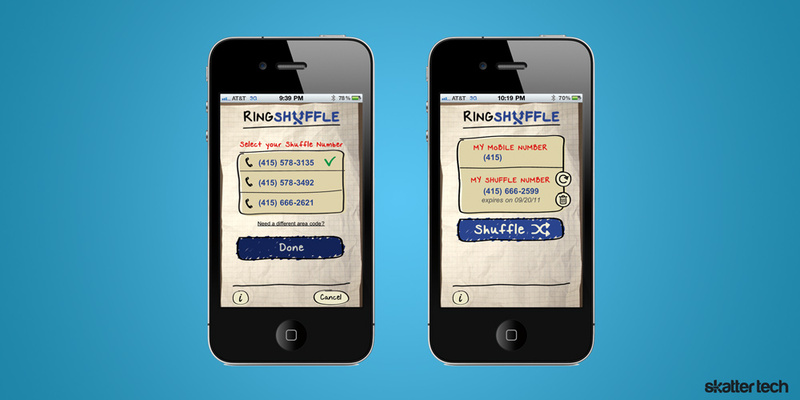 Well, today at TechCrunch Disrupt 2011, I met the team from RingCentral who showed off a neat little solution to this problem: RingShuffle. RingShuffle is a service that allows anyone to instantly create a temporary phone number which expires in seven days and can receive calls anonymously. It simply forwards any incoming from the created number to your permanent one. It is available as an iPhone app and on the web for all other phone. I tried it by downloading the app on my iPhone 4. Once launched it took just a few seconds to register and choose a number. I had the option of choosing from three numbers within my area code. And that’s it. Just give the number to the intended person to let them reach you without revealing your real number. The number automatically expires in seven days, but users can manually extend it for another seven. It is easy to unlink the number with just a single click too. So the next time you need a disposable number, just use RingShuffle to create an alias to mask your real one. While the iOS app is already available, we were told an Android app is in the works.